A glamorous black metal exterior lends itself to enhancing virtually any décor, while brass-clad interiors create a refined backdrop for display of glassware, bar accessories, wine and spirits. 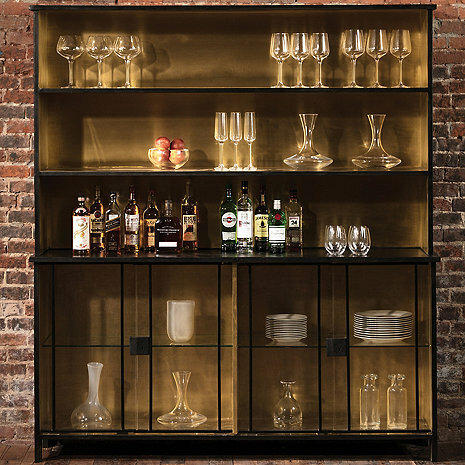 Multi-functional and adjustable glass shelves accommodate various bottle heights and glass doors feature key-locks for secure storage. Separate compartments at the bottom are perfect for distinguishing decanters, collectibles and more. Sideboard sold with hutch as well as individually. Does this have lights in it?